When Taken (2008) was finally released in North America, after already playing in Europe for a year, it became a surprise hit. Not bad for what is essentially a B-movie revenge story starring an A-list actor. The film was produced by French filmmaker Luc Besson, who’s responsible for action classics like La Femme Nikita (1990) and The Professional (1994). He also produced and co-wrote the popular Transporter films so he certainly knows what audiences around the world want to see. Brian Mills (Neeson) loves his daughter Kim (Grace). Even though he and his wife (Janssen) are divorced, that doesn’t stop him from going to his daughter’s birthday party. He’s a retired government agent skilled in counter-terrorist tactics and is coaxed into doing a routine protection job by his buddies. This sub-plot gives us an early indication of how good Mills is at his job so that we believe he is capable of what he does during the course of the rest of the film. Kim decides to spend the summer in Paris and this doesn’t sit well with her father who isn’t crazy about the idea of his 17-year-old daughter living in a strange country, especially when he finds out that she’s following U2 all over Europe. It only takes a few hours before Kim and her friend are kidnapped in Paris by a group of Albanians. It doesn’t take long for Mills to do a background check on these guys, fly to Paris to find his daughter and make the guys who took her pay dearly for their crimes. As soon as Mills lands in Paris, Taken kicks into high gear as he uses his considerable skill sets to deadly effect. The filmmakers do a nice job of establishing Mills’ love for his daughter and it doesn’t hurt that Liam Neeson comes across as very sympathetic and likable with eyes that can be warm in one scene and then convey icy determination in the next. He is also believable as a one man killing machine who can work his way through the Paris underworld to find his child. Taken was directed by Pierre Morel who also helmed the vastly entertaining French action film District B13 (2004). With that film, he demonstrated a knack for staging and choreographing exciting and visceral action sequences. 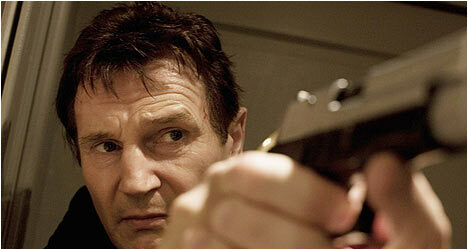 With Taken, Morel is also able to have the audience develop an emotional connection with Neeson’s character as well as delivering kickass action scenes. The film delivers exactly what it promises: an excellent and entertaining thrill ride with no frills. It is as single-minded as its protagonist’s mission and plugs in exciting car chases, fight scenes and gun battles. And yet, you are still emotionally invested in Neeson’s character – you care about what happens to him and his daughter. The result is a truly satisfying and engaging film. On the 2-Disc edition, you have the option of watching the theatrical version or the unrated cut. There is an audio commentary by director Pierre Morel and cinematographers Michel Abramowicz and Michel Julienne. They decided on two distinctive looks for the film: sunny and vibrant colours for Los Angeles and a darker vibe for Paris. They talk about the differences between American and French film crews. They also praise Liam Neeson’s ability to play a loving father and a deadly killing machine. They also talks about the challenges of working in a city like Paris. “Le Making Of” is fairly standard if not engaging press kit material with the main cast talking about their characters and the story with clips from the film. There is plenty of behind-the-scenes footage of some of the film’s exciting action sequences being shot. “Avant Premiere” features footage of the film’s world premiere in France with Neeson, Morel and Besson doing interviews on the red carpet. There is haunting footage of Neeson and his late wife Natasha Richardson who was also in attendance. Finally, there is “Inside Action: Side by Side Comparisons,” which takes a look at six action sequences being filmed along with the finished product.